Pengarang MARK BIGHLEY & RICHARD ERICKSON, ED. By Johann Sebastian Bach (1685-1750). Edited by Richard Erickson. For C and Bb obbligato instrument parts, continuo and realization. General. 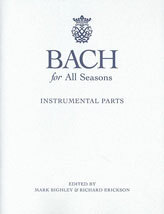 Bach for All Seasons. Choral Collection. Instrumental Parts Only. Published by Augsburg Fortress.